Bududa Landslides: Who is really responsible for securing the land? There has been a real tragedy again befallen on the Mount Elgon Region, as the Budabuda District was hit with another landslide. This is a district that is known for this and has had fatal landslides in the past, as the rain of October and November can create landslide in the eroded land and in the slopes of the hills, where people reside and have their small farms. Therefore, this isn’t a new problem. There are reports on the matter, but still this week was hit with it again and new losses of lives. Which is such a tragedy. In 2010, there was estimated 100 dead in Namesti Village in the district. By today, in the district the Red Cross says the number of dead is up to 42. All of which is a lot, as there are supposed to be safeguards and warning systems, also funds to secure help as the disaster happens. After the last big landslide, the district MP Olive Wonekha wrote this: “Putting a system in place to cater for all the emergencies has not been easy. The Government of Uganda together with many well-wishers including the Red Cross Society which is at the forefront of the humanitarian aid, Development Partners are grappling with the medium and long-term solution to the issue” (AAH Uganda, 02.04.2010). “Factors responsible for this phenomenon include; Human activities (steep slope cultivation, cultivation on river banks, deforestation) and excessive rains” (Bududa District – ‘Five-Year District Development Plan’ 27.04.2011). In the same plan, they have a plan for adding more forest and trees in slopes to stop erosion in the soil, we can wonder if they ever got the one road they needed and the seedlings to do so. That they could do one thing to secure the slopes and hills. As the rain pour is steady and known about in the region. We understand why the Local Government and District has little say in the matter of disaster, as the Office of Prime Minister says they are number 12 on the list of responsible in 2010, but a technical note from 2015, says it is local government who is legal obligation. Its not strange, that their will confusion and uncertainty who has the final say and who should step into action. vi. Makerere University, Geography Dept. xvii. Ministry of Health” (OPM – ‘THE NATIONAL POLICY FOR DISASTER PREPAREDNESS AND MANAGEMENT’ 2010). A technical report commissioned by the UNDP on behalf of the Office of the Prime Minister in August 2015 states this about landslides: “Herewith each district environment committee is responsible to take necessary measures to minimise the risk of environmental degradation of riverbanks and shores. Similarly section 38 highlights the identification of hilly and mountainous areas and also places a legal obligation on local government for the assessment of such areas in terms of environmental degradation. In light of the significant landslide risk within Uganda, this element should go along way in addressing landslide risk” (OPM – ‘Governance of disaster risk reduction and management in Uganda: A literature review’ 2015). “We want to applaud government’s proposal of allocating UGX 77bn to the contingency fund; this being the first time the provision of the PFMA of constituting a contingency fund is being implemented. However, the proposed allocation is below the 0.5% of the previous financial year’s budget as provided by Section 26 of the PMFA 2015 as amended, we pray that an additional UGX 66 bn be provided to fully implement the provision of the PFMA. We demand that Government respects the percentage towards Disaster response and management as required by the law under the Contingency Fund” (CSBAG – ‘UGANDA IS NOT FLOOD RESISTANT… IT’S TIME TO ACT’ 26.03.2018). When we see it like this, the state is clearly not managing the disaster response or the funds for possibly coping with it. As the landslide this week is showing, is that the government of Uganda isn’t prepared and their citizens are paying. As well, as the local government doesn’t have the funds or ability to ensure their own 5 year development plan. Which was made a year after the biggest landslide in the recent decade. Therefore, the state knows about this, but still doesn’t act upon it. We have to question the OPM and the other government institutions, not only the Local Government who hasn’t acted, but they might lack the budget and the expertise, that all the other responsible institutions in this manner. What is sad is the loss of lives and the knowledge of plans and lack of inadequate funds… which could have saved lives and ensured a better disaster response. Something everyone deserves, as the government knows this region is hit with this, as the rains of September and October can make the land erosion. Therefore, time to push for the government to really act, so next time there be less loss of life and more action to ones in need when it do happen. Peace. Just to show some of the actions done during the election period today, by the Calvary and this happening in Iganga, Sanga Town, Kazo County, Kiruhuru Disrict and in Bukwo. Go-Forward has had issues with Police and NRM-Regime, because of the newly appointed arch-nemesis Hon. Amama Mbabazi the former NRM big-man. In Iganga town there was supposed to be a procession to happen unto the campaign rally venue in the town. While local police didn’t want that to happen and tried to block the main street; they did not succeed on the matter. Instead the locals were powerful enough to stop the block and walk in procession anyway. The Calvary did not win there today. A man was certainly involved in tarnishing campaign posters in Sanga Town Council, destroying them and pinning them down. There been saying that he has been doing so since the campaigning started. “Kazo county ‪‎Go Forward coordinators to be arrested by state operatives any time from now” (…)“We are reliably informed on how security is planning to arrest all our Coordinators in ‪‎Nkungu and ‪‎Buremba subcounties in Kiruhura district today after their refusal to cross to ‪NRM recently”. “GP Gen. Kayihura came to ‪‎Bukwo yes to and paid Ush. 5m to the two victims shot during Besigye’s rally in Bukwo. And today he went to the IDP camp of Kapkwobor with UWA representative. I thinks that is enough for today. This is my 2.0. It’s a 2015 Edition. I wrote a piece that I use a long time on and the books I had read to fit into prove how the Government of Uganda and the NRM-Regime had failed their marquee program. Their famous Ten-Point Program. I wrote a piece that I posted in 2014 with what we can call little older and scattered information. This here right now will be based on what has happen in 2015 and the situation right now economical and development that has happen in the recent year. The other one had far-far and old date material and reports. This here is fresh (for now) in two years’ time this here will also be old, but since this election season, I had to make regenerating this. Point by Point look that the situation and shortly discuss them. I know for the die-hard NRM and Musevenist. This is just pure hog-wash even if you can see the painting on the wall; you will still deflect the issues that are there. NRM-Regime has had the opportunity to make these changes and give Uganda and its citizens what it ought to have. What the opposition and civil society asks for and question the leadership; and regime about. Instead there are other reactions to this. But instead of me just writing small-talk let you read the findings. The sole candidacy of YKM in the NRM proves that there are not democratic institutions YET; and the NRM Primaries have made Uganda famous for Pre-Ticket Ballot-Papers and stuffed ballot-boxes. Also with the sole candidates of Evelyn Anite and Sam Kutesa didn’t have competitors in their respectable voting districts these NRM primaries. So if you want to restore Democracy and you still lives by the possibilities of having election which is rigged and have single candidates, then it’s not really an election, but a sad exercise of necessity and not to get the once who supposed to represent the members of the NRM-Party. When the ruling party can’t act democratic and have free and fair elections, how can they make that happen in 2016? They still haven’t achieved this point. Proving this point that they haven’t achieved it is with the constantly detaining of opposition leaders and keeping them in house arrest, or even preventative arrests. Also using the POMA law to disorganize the Opposition parties and their campaigning while the UPF is steady on to destroy their work in the districts and fields. Throwing activists in jail without trial and letting them pay heavy bonds. This is not a look or proves that the system is still based on the NRM-Regime and their elite, even inner-party members has been jailed for supporting Amama Mbabazi instead of supporting Yoweri Museveni. This point is not yet valid. “Davis Akampurira lost his premolar tooth last night when he was beaten intensely after being kidnapped by “state operatives”. The reason given was that the buffoons had gathered intelligence of him being funded by Amama Mbabazi to fight the state and son of Minister Bright Rwamirama….Mwinempaka. We who sent Davis has told him to come independent” (Reported by Meta Moses, 02.11.2015). The Fautima Zaina incident shows that the security of the people is not withhold in the country when the police manhandle her like they did. Also the Way the police carries themselves with tear-gas and shootings during the Western rallies of the FDC in October. And this has been thread that has kept going the entire calendar of 2015 and sure will happen until the election in February of 2016. So the security personnel and police is not securing peace for the people, but making fuzz and generating violence because the Opposition parties try to do their program in the country. We have the all of sudden Police detaining Norman Thumuhimbise of the Jobless Brotherhood when he was taken by the police in the night in Kampala by the Flying Squad, without any court order or official paperwork just suddenly taken in August and after a few days he returned after family requests for his release. Another example is also Vincent Kaggwa was taken by the Police in July this year and was released a few days later from an undisclosed location. He is one of the supporters of the Amama Mbabazi ticket at the time he was wearing a T-shirt with his name and face. Apparently the NRM Youth Leader had done enough to be detained and taken away with no court order for no reason at the time and released a few days later. When it comes to the property it has been issues with that this year. The government has not withheld the level of trust between land and persons. One of this is the Palm Oil Plantation on the Island of Kalangala Land used for that purpose and to for the local farmers. The others main issues is the Amuru land grab in Apaa Village where the land is taken for hunting grounds and sold without the local agreement from central government. Also the Sugar Factory built by Kakira Sugar Works which is owned by the Madhvani Group who got allocation of 40, 000 hectares of land in the Western part of Amuru District. This proves that in 2015 the security of all Ugandans is not yet there, especially if you’re not a part of the NRM-Regime or the NRM elite. Then you are free for all for the UPF and other organizations to take advantage of. 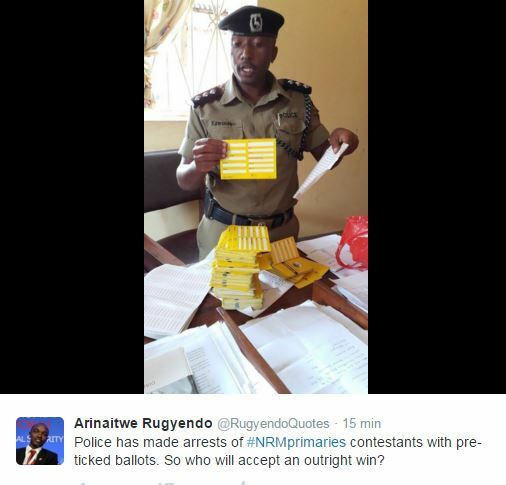 Even NRM’s own can be taken and become felons because of their allegiance to somebody else than Museveni. 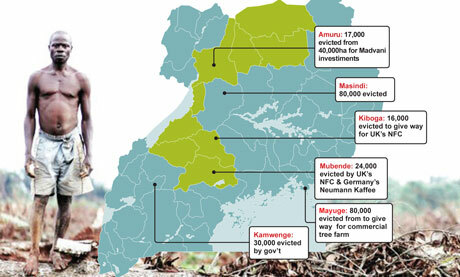 The land grabs proves that the property isn’t withhold to the people of the area, the bigness of the Kalangala and Amuru is massive, also with the government sale of land without consultation or consideration of the public and citizens, but seems that the only thing matters is the cash coming from corporations and investors from afar. Another point that is also not valid. “Britain’s goal in Uganda has been to establish a fully democratic parliamentary system which would fit the country for internal self-government in a short time. British Colonial Secretary Ian Macleod opened a new Legislative Council on Sept. 18, but the “parliament” was boycotted by Mutesa II, 34-year-old, Cambridge-educated Kabaka (king) of Buganda. Buganda has its own Lukiko (legislative council), which voted on Sept. 24 in favor of secession from Uganda. However, the Kabaka’s court has not yet approved the vote. Because the Kabaka’s government is by far the strongest political force in Uganda, it is in position to block development of a strong central government” (…)”A statement by Buganda authorities last Feb. 12 asserted that they had “always advocated a federal form of government for Uganda.” They distrusted the trend toward a “unitary form of government” which might endanger Buganda’s “traditional institutions.” The Kabaka, who is a god-king to 1.7 million of Uganda’s 5.8 million people, has been fighting a delaying action against changes which threaten to undermine his ancient feudal powers, Milton Obote, leader of the Uganda People’s Congress, most powerful of Uganda nationalist movements, has labeled the Kabaka’s court “reactionary.” (…)”Britain’s insistence that Uganda have a strong unitary government has given the Ankolo, Bunyoro and Toro tribes, as well as the Kabaka, an issue on which they are united—tribalism. Strong tribal allegiance and the resulting preference for federalism are not confined to Buganda. Tribal chiefs fear that the nationalist parties, such as Obote’s, will undermine their chiefdoms. But the smaller tribes are suspicious of the Kabaka and refuse to accept his leadership in any form” (Blumenfeld, 1960). “The office of the Supreme Mufti has disassociated itself from what it has described as unprincipled call for unity by the leaders at Old Kampala. This is after the leadership of the Uganda Muslim Supreme Council organized a national unity prayer session slated for Friday at the Old Kampala mosque. However, the spokesperson of the Kibuli sect Sheikh Hassan Kirya has told journalists at a news conference held at Kibuli mosque that the spiritual status and integrity of the people behind this move is suspect especially with regard to their conduct towards fellow Muslims. Sheikh Kirya is instead asking that the council addresses the root cause of disunity” (Ageno, 2015). “Currently, Uganda’s life expectancy is 58 but the Sheikh has died at 83. Even at that age, he was still very strong, especially mentally. His death is a big blow to the Muslim community and his efforts to unite the Muslim community in Uganda” (…)”We have arrested many people who have been killing Muslim sheikhs and those who are still on the run shall be arrested” (…)”What divided us (Muslims) was lack of transparency in the custodianship of our property. But all we need is unity among Muslims” (Kafeero & Bwire, 2015). “Am glad that NRM is able to maintain peace supported by you people. The population of Uganda has gone up. I urge you to support and maintain this peace” (Statehouse, 2015). ““We used these venues to enlighten the people. Uganda had had the challenge of not knowing what to do within the political leadership,” adding that those ideological meetings took place in Bulambe and Kangave in Luwero district and at Bukatira in Nakaseke district. Mr. Museveni who was accompanied by his wife, Mrs. Janet Museveni, noted that during the 1950s and 1960s, people were misled along sectarian considerations based mainly on religion and tribes. He was, however, pleased to remind the gathering that the country has now managed to foster stronger national unity because of the viable Government of the country. He used the occasion to introduce the Chairmen of the various organs that were in leadership during the struggle in the Luweero area. He also paid special tribute to Rev. Fr. Ssesanga who took the President’s mother from the area to Nairobi and ensured her security during the liberation war. Mr. Museveni paid tribute to his wife, Mrs. Janet Museveni, for looking after their children when he was actively engaged in the struggle. In the same vein, he thanked Mrs. Gertrude Njuba and Mrs. Olive Zizinga who took care of his meals at the critical time during the struggle” (Mediacentre, 2015). “Promotion of national unity and guarding against the resurgence of all forms of sectarianism. Implementing programs geared towards the socio-economic transformation of society, such as providing a healthy environment for industrialization and job creating through public and private investments. 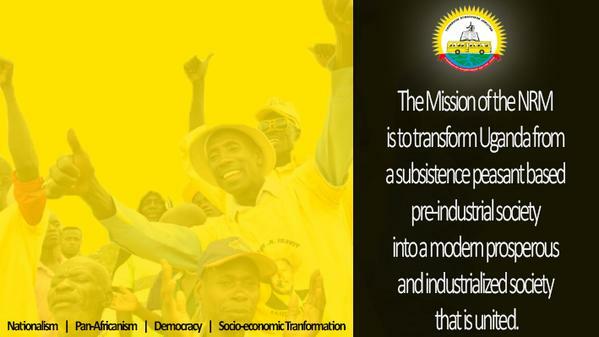 This is in line with the strategy of building an independent, integrated and self-sustaining national economy. 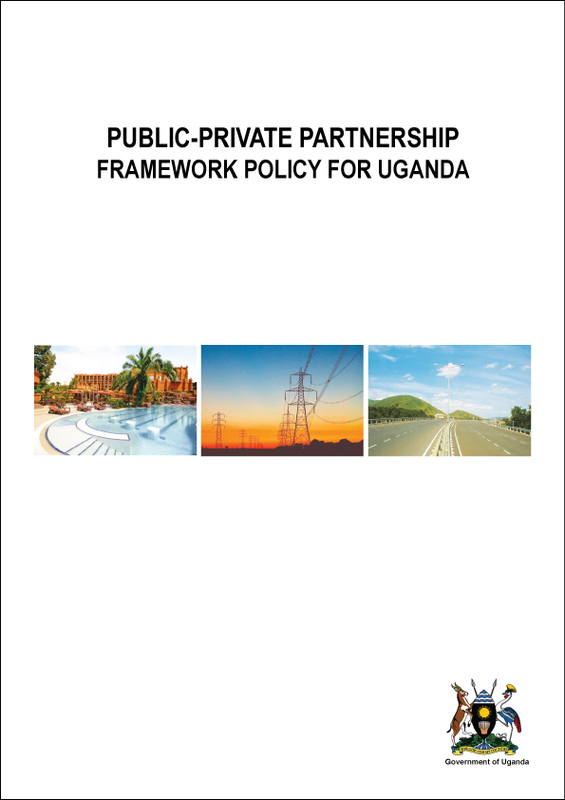 However, the strategy is largely private sector led” (NRM, 2015). The NRM has done more for the National Unity and has made an effort for the kingdoms to reconcile, even if there been issues like recent years like between the Baganda Kingdom and the Ankoli. Or the Bunyoro with their land and Tororo after the fall of Gadaffi which supposable gave less power to kingdom after this, then you have the fiefdom of Busoga which haven’t gotten much credit from the National Unity work. So the NRM has done something good here I got to confess, though I am sure that the Northerners feels left out after the institutions are stronger in Bunyoro, Baganda and Tororo, and not in Acholiland, Karamoja and so on. There are things to work on to continue to make a clear national Unity. This one is a close achievement though the killings of Muslim clerics and the miss of certain areas of the country; half not passed and half verified point. “The contractual fundamentals enshrined in the Ten-point Programme and promise of a fundamental change that was already exhibited in the discipline of the triumphant rag-tag NRA guerrilla fighters instilled an unprecedented sense of relief and confidence. Ugandans envisioned the end to state-orchestrated wanton murders; the end of the culture of political violence, torture, arbitrary arrests, the repressive modus operandi, and above all, the opportunity to freely elect and peacefully change their leadership. It was considered a dawn of a new era. The exceptions were the people of Northern Uganda region, where the defeated armies regrouped and waged an extended war led by Alice Lakwena and Joseph Kony. Internationally, Museveni’s conversion to neo-liberalism earned him Western acclaim of a ‘unique visionary, charismatic leader’ and primus inter pares of the ‘new breed’ of African leaders (Oloka-Onyango 2004; Kjaer 2004)” (Asiimwe, 2014). “The eventual opening of political space was a protracted process whose landmark was the November 2004 Constitutional Court ruling against some sections of the Political Parties and Organisations Act (PPOA). The Court pinpointed the unconstitutional infringement of some PPOA sections on fundamental civil and political rights, for instance, freedom of association and assembly. With the opening, new political parties emerged. The Forum for Democratic Change (FDC), a merger of the Parliamentary anti-third term group (PAFO) and Dr Kiiza Besigye’s Reform Agenda that contested the 2001 presidential elections, was the most prominent of the new parties. Traditional parties like DP and UPC considered FDC as a credible and trusted party, and forged a common working relationship with it under the G6 framework. 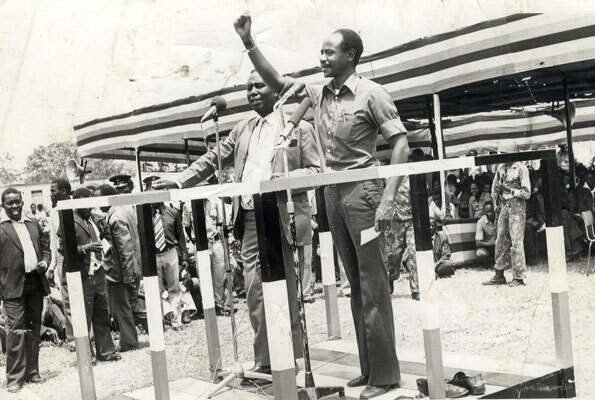 Establishment of grassroots networks and infrastructure was not smooth for parties like the FDC. 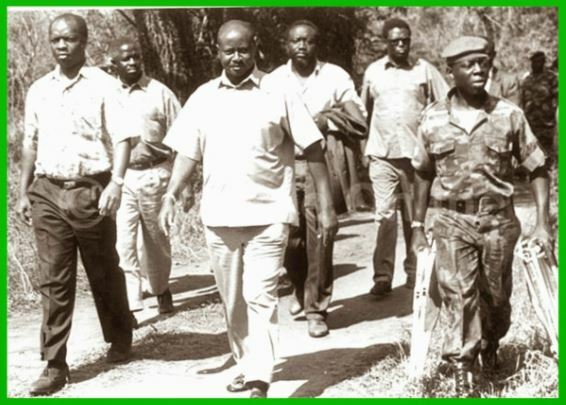 The NRM had an elaborate village to District level Local Council system that combined administrative functions with championing grassroots Movement interests. This was overseen by political appointees like Chief Administration Officials (CAO), security operatives and Movement cadres. Additionally, the police served the establishment, and para-military units like the Kalangala Action Plan were reminiscent of the old-time UPC’s National Security Agency (NASA). This elaborate apparatus aimed at weakening competing political parties through a combination of indirect and direct strategies like co-option, harassment, sabotage, repression or even elimination. Claims of sabotage were made, for instance, in Gulu, Hoima, Masindi and Kisoro (The New Vision 9 August 2005; The New Vision 27 June 2005; The New Vision 18 July 2005)” (Asiimwe, 2014). The lands are peaceful but the oppression is making it less of peace as seen how they goes against the Opposition leaders and their parties. So there are issues that does destruct the picture of what the NRM-Regime really has done, because their hinges to power now destroy what they have built while trying to underscore their competitors in the political landscape. This point is half made and half not. Point 5: Laying a basis for building: an independent, integrated, self-sustaining national economy. From FY2006/2007 it was Domestic Debt and Outstanding(DoD) was US$1.47 billion. And in FY 2013/2014 had risen to US$4.3 billion (MTDS, P: 13, 2015). Government expenditure is on an average to be 20.9% of the GDP for the FY 2014/2015. In the 2015/2016 it is 21.7% of the GDP. The main expenditure for the budget is the infrastructure projects like the upgrading of Entebbe International Airport, Hydro Power projects and Albertine Regional Airport. The total cost for the projects is US$7.0 Billion. There is set to be 5% target for the inflation rate and the exchange rate is set for 12.1% in FY 2015/2016 and average for 2.4% the rest of the years for the medium term (MTDS P: 17-18). That the total debt-to-GDP from the current level of 28.6% by the end of June 2014, if the end of the time it might end up with 50% level by 2020. This is because of substantial projected increases the fiscal deficit. With the worst strategy the interest rate can go from 1.4% in June 2014 to become 4% in 2020 (MTDS, P: 24, 2015). Point 5 is not valid. The scary numbers are the reason why! (Republic of Uganda May 2015). They have started and even officially started to loan money for the restoration together with the major national programmes like National Development Program II and Vision 2040. So this point is not valid! Here are a few cases from the recent year that proves that elimination is far from the surface and eliminated with corruption in the public life. There is so many cases but here is a few! 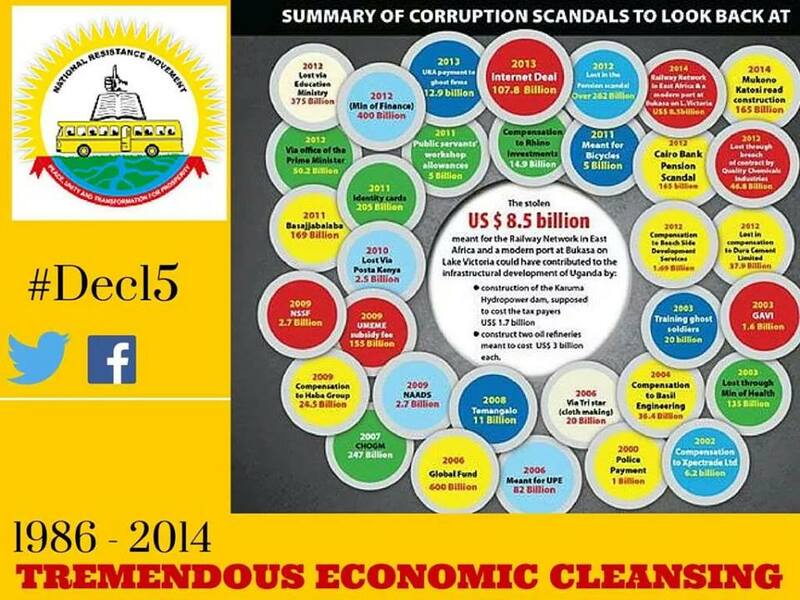 “A significant amount of evidence supports the view that the incidence of grand corruption in Uganda has increased over recent years. Recent cases involving the embezzlement of public funds suggest the effectiveness of state institutions in monitoring government programs is limited. 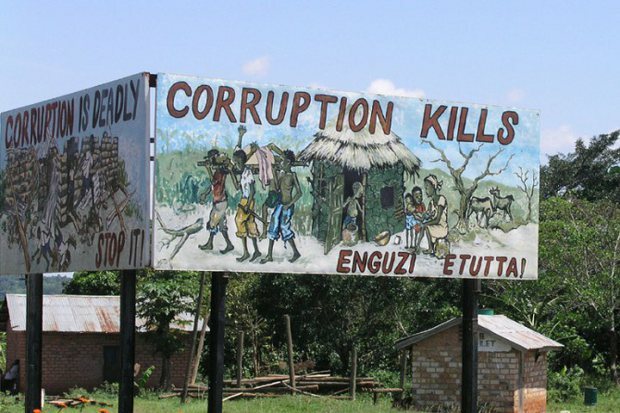 Recent examples of cases of grand corruption include the fraudulent procurement of a contractor for the Mukono-Katosi road and subsequent advancement of UGX 24 billion to nonexistent contractor to kick-start the road construction in 2014; of UGX 205 billion through the national identity card system scam in 2011; and of UGX 58 billion lost in the OPM in 2012, among others” (Inspectorate of Government P: 33, 2014). “The Anti-Corruption Court yesterday convicted six MTN staff after they were found guilty of illegally gaining access to the mobile money system and wired cash amounting to more than Shs3 billion to various money agent lines that they shared thereafter” (PCTech Magazine, 2015). “In November 2014, five officials of the Uganda Wildlife Authority were suspended after almost 1.5 tons of ivory worth more than $1 million vanished from a government store room. In response, the minister for tourism suspended the Uganda Wildlife Authority’s executive director, Andrew Seguya. But he returned to office just a few months later” (Athumani, 2015). “A Uganda National Roads Authority (UNRA) official was last Friday quizzed over billions of shillings on his personal account, yet his official salary was only Shs5m a month” (Kasozi, 2015). This point is far of chart that I have to say it super-un-valid! Point 8: Settling the peasants that have been rendered landless by erroneous “development” projects or outright theft of their land through corruption. 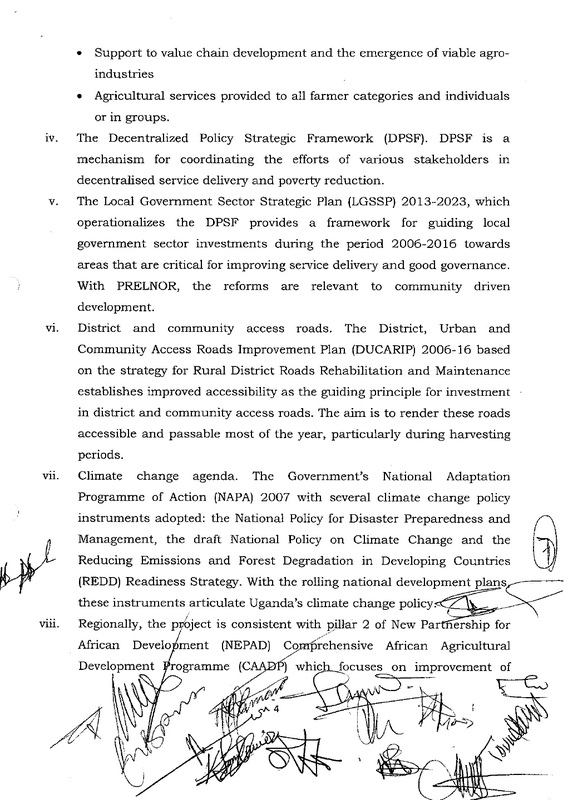 Check again the Point number 2 since the answer is there on the land grabs and the issues it has, especially with the situation in Amuru and Adjumani districts with the allocation of land for Sugar Works Factory and hunting grounds in Apaa Village. Also with the land grab for the development project or building the Palm Oil plantations on Kalangala Island. 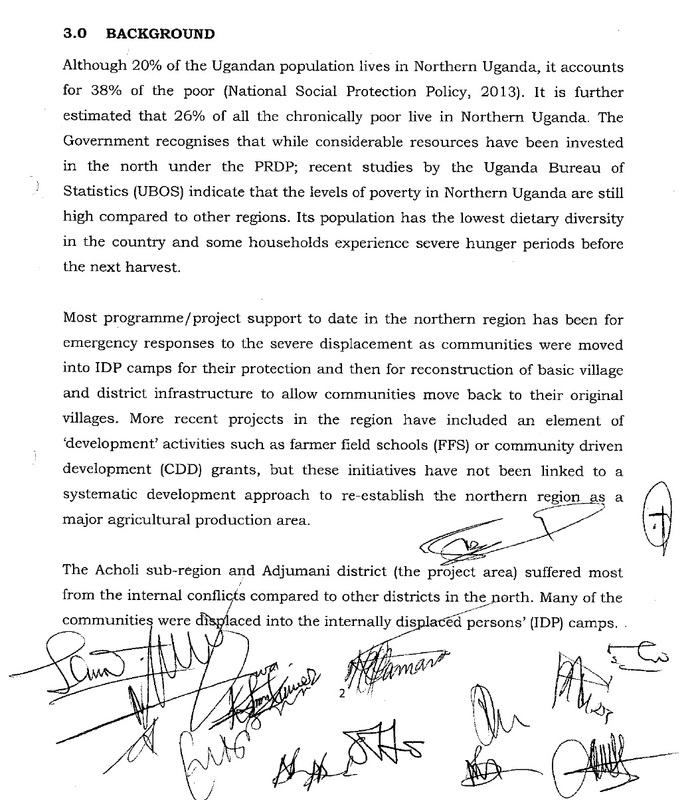 The issue in Northern Uganda ends also up with those staying in the camps that Internally Displaced Persons are not getting a piece of land to settle down and get a livelihood after the long trial with droughts and wars in the area. This one is too damn easy, not valid before the IDPs get a piece of land and not business men getting giant plots for their business and pleasure. As the Government of Uganda has to fix the issues of giving their citizens their land and plots; and also finding the place for development, but there is also the issue of listening to the Local Councils, Chief’s and MPs to find a significant way of doing it, instead of shuffling over them. In the recent year the UPDF the Ugandan army has been in the South Sudan, Central African Republic and Somalia. In the Central African Republic they are still hunting for the LRA on mandate from the UN and the same with the Army troops in Somalia in the African Union Mission in Somalia (AMISOM). 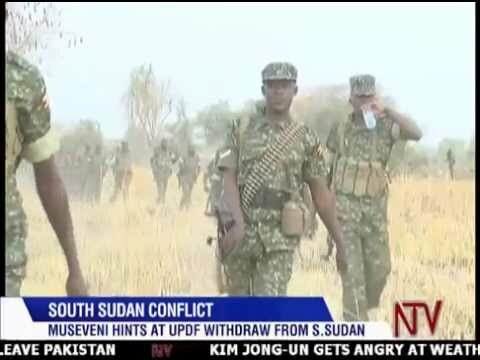 “John Ken-Lukyamuzi, who is the leader of the opposition Conservative Party in the national parliament, further said the deployment of the Ugandan People’s Defence Forces (UPDF) in South Sudan was a violation of international law” (…)”The lawmaker further said there was no evidence indicating the official invitation of UPDF by South Sudan president Salva Kiir, saying president Museveni failed to provide the invitation letter to parliament when inquired to produce it. However, Uganda government on many occasions alleged that its troops were invited by president Salva Kiir (Sudan Tribue, 2015). “Uganda plans to send more than 240 of its health workers to the Caribbean despite criticism and the threat of an aid cut” (…)”Officials have said the scheme is merely part of Uganda’s bilateral cooperation with Trinidad and Tobago, from which Uganda has also benefited – with aid such as oil and gas industry training and financial support for its police” (Al Jazeera, 2015). “HUMAN rights activists from various civil society organisations have refuted the recently signed labour agreement between Uganda and Saudi Arabia to employ graduates as domestic workers, arguing that it is modern day slavery” (…)”“The government does not seem to be bothered about where these people are going to work, but rather to let go of them,” Ndifuna said” (Muhindo, 2015). The military does certainly something positive abroad if they follow the international mandates from African Union and United Nations, but the ones they went in to without a mandate that was in South Sudan. In the midst of the year with the turmoil and demonstrations towards the third term in Burundi became part of the mediation team between CNDD-FDD and the opposition. The opposition felt that the NRM-Regime and their men had a loyalty to their friends in the government and not discuss in the matter towards a gentle agreement between the parts. So parts of this point they actually do well, with the armies for the mandates, but the none mandates and how they have agreements to send people to other countries to earn quick money and not secure themselves. So it doesn’t seem they do it for generating Human Rights or Democratic values, more to gain money for the government. Half Point is cleared and half point is not. ““The Uganda National Roads Authority (UNRA) is the implementing agency for the planned KAMPALA JINJA TOLL EXPRESSWAY. It will link the capital with the important industrial area of Jinja. Past plans have been for four to six lanes for the 77-kilometre road. Cost estimates have also varied from USD 700 million to USD 1 billion. There are reports that the ministry of transport will be floating a USD 1 billion Public-Private-Partnership (PPP) tender and that the International Finance Corporation (IFC) will be the lead financial adviser. Construction could commence in 2015 with commissioning in 2020. COMESA has declared it to be a priority Project that is an important component of the Mombasa-Kampala – Kigali northern corridor” (APA, 2014). “Uganda Registration services Bureau (URSB) has today entered into an MoU with National Social Security Fund (NSSF) to enable information/data sharing on companies registered with URSB and bio-data for NSSF members” (…)”The Partnership with NSSF isn’t the first for URSB, because earlier partnerships have already bore fruits. Together with KCCA and URA, URSB is running a TREP project, which has seen the organization register many business names in Kampala, and has now devised plans to roll out to the countryside beyond Kampala” (…)”Other Partnerships with UIA and Posta Uganda have seen URSB centers housed within the two institutions, a move that has eventually reduced congestion at the URSB head office and also saved peoples’ time and costs on transport to reach the URSB head office for registration services” (Minbane, 2015). They have achieved this one, but at a price of exhilarating the prices for public building by having the Public-Private Partnerships which leads to higher levels, MoUs and contracts from constructions companies and the Government of Uganda. This here is a valid point. Point 3: Half not passed and the other half passed. Point 4: Half not passed and the other half passed. Point 9: Half not passed and the other half passed. Totally 2, 5 Points out of 10 in 29 years is not impressed! There is always easy to write visions, talk about wish to develop the organizations and country. NRM-Regime has had the time to build and rebuild the country. The NRM-Regime have had opportunities to deal with this program and achieve it, instead they have lost focus and turned into a crony elite who self-serves instead of serving the citizens. That is supposed to vital to any government to give services and reforms to build society to a better place. NRM-Regime has gone away from their core-principals. Therefore you can easily see that they haven’t tried hard to fulfil their Ten-Point Program. Peace! PS: If this isn’t enough for you? Republic of Uganda/Directorate of Debt & Cash Management – Ministry of Financing, Planning & Economic Development: ‘Medium Term Debt Management Strategy’ (MTDS): 2015/2016 -2019/2020 (April 2015). 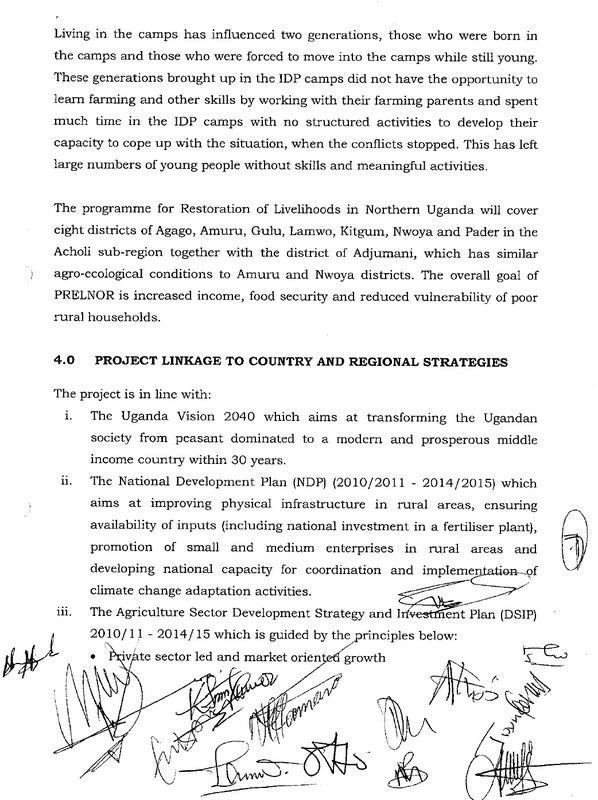 Republic of Uganda – ‘SECOND NATIONAL DEVELOPMENT PLAN 2015/16 – 2019/20 (NDPII): “A Transformed Ugandan Society from a Peasant to a Modern and Prosperous Country within 30 years”. The Democratic Alliance (TDA) has learnt with shock and consternation of the deployment of heavily armed police and the military in Apa Parish, Pabbo sub county, Amuru district. The aim of the deployment is to subdue the residents violently in order for the government to demarcate boundaries between the districts of Amuru and Adjumani. They also claim that they want to demarcate the boundary of East Madi Hunting Area. In 2012 the Uganda Wildlife Authority sent armed Rangers with the backing of police and the army to forcefully evict the residents of Apaa. People were beaten up, their livestock raided, their houses burnt and their crops set on fire. Some young men were shot dead in the operation. Twenty five men were arrested, beaten severely, taken to Adjumani where they were charged with offenses ranging from criminal trespass, being idle and disorderly to threatening violence. Primary schools were closed down, the pupils and teachers sent away and the school desks were being used as firewood by the army and police. In fact the school became the command post of the army complete with a road block along the road leading to the school. We are aware that this forceful eviction is being driven by a profit motive. We are also aware that at the instigation of Hon. Moses Ali, the area had been offered by Adjumani district to one Bruce Martin, a foreign investor, to be developed as a private game ranch and hunting area. We feel that since the affected area is not under the exclusive jurisdiction of Adjumani district, it requires cross border collaboration and a joint discussion and a shared decision and consent by the neighboring districts of Amuru and Adjumani. After the incident where mother of Apa exposed themselves naked be fore the government delegation in protest, government made a commitment that a border meeting would be convened to listen to the concerns of the residents and the leaders. To our surprise, we were told that three days ago a team comprising the army, police and other government officials were already on the ground and had come in via Adjumani district and were carrying out a survey, boundary opening and were also planting mark stones. This was in total contravention of the spirit of dialogue. Leaders tried to access Apa but roadblocks were set up and they were prevented from speaking to the people. Three people are now confirmed dead by sources in Apa. Several people suffered grave injuries and are being treated at Amuru health centre. The Member of Parliament Gilbert Olanya was arrested and is believed to be detained in Masindi police station. We condemn the greed behind this illegal and violent eviction of people trying to settle down after twenty years in concentration camps. We demand that this illegal survey and boundary demarcation he halted immediately. Only open and transparent dialogue with the affected communities can resolve this matter. Force and violence by the army and police will only escalate an already volatile situation. 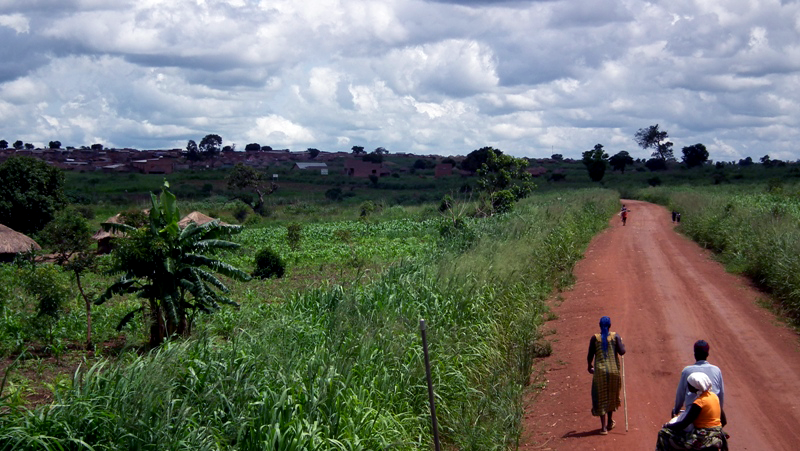 For centuries the people of Madi and Acholi have coexisted and lived peacefully and there has never been any dispute over the administrative boundaries of the two districts. A case in point is Bibia Parish which is located in Attiak Subcounty, Amuru district and has a considerable population of ethnic Madi people. The administrative boundaries of Amuru and Adjumani are well known. That is why we believe that this current dispute is being orchestrated by greedy people who have selfish interests. 1. Any attempt at a unilateral process of survey and boundary opening at the instance of Adjumani district or the central government should be halted. 2. A high level meeting of government representatives, leaders from the districts of Adjumani and Amuru should be convened by to clarify issues of contention and provide an initial platform for dialogue. 3. A meeting of the communities that reside in the affected area should be convened in order that they become part of the efforts to seek a solution rather than being victimized by decisions and actions imposed from above. 4. Trusted mediators should be sought and asked to get involved in facilitating dialogue by the affected communities. The residents of Apa have for instance proposed that Archbishop John Baptist Odama and retired Bishop Macleod Baker Ochola be asked to mediate in this conflict. TDA stands in solidarity with the people of Apa. We demand that the media blackout and the isolation of Amuru stops. This brings back memories of Operation North when the entire region was cordoned off as soldiers violated human rights with reckless abandon. Finally, we know that the NRM regime doesn’t adhere to the rule of law but we wish to state that the matter is before the courts of law and the court has issued an injunction against any further survey and boundary opening. Government should act impartially and without any undue delay in order that an amicable solution to this problem be found.